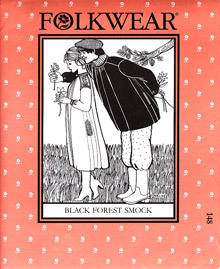 This traditional smock was called a Kittle, or over-garment, worn by workers in Germany, Switzerland, and France. Soft pleats fall from a wide neckband. Sleeves connect to side panels with gussets and are pleated at the wrists into buttoned cuff bands. Shoulder yokes, pocket welts, neckband, and cuffs were often decorated with chain-stitching (design and instructions are included inside pattern).